Kids like dinosaurs and I was no exception. In fact, I liked dinosaurs more than the average kid. Before I could read, I knew their names & characteristics. I knew which period of the Mesozoic Era the important ones lived. When I had kids, I wanted to pass along my knowledge about the science of the paleo-worlds, about dinosaurs. Trouble was, the things I knew were no longer true. You would think something that happened at least 65 million years ago would be less subject to the vagaries of current fashion. My dinosaurs were big, slow moving cold-blooded reptiles. They came in dullish colors, ranging from brownish grey to greyish brown. My kids’ dinosaurs were quick and colorful. Some were warm-blooded and even had feathers. It is passing uncomfortable to know that a lot of our core scientific beliefs will be overtaken by events within our lifetimes, but that is the nature of science. It is always in draft form, never settled or true for eternity. That is the strength of science, not its weakness. And it does not mean that all facts are equal, that we can just believe whatever crap we like on the supposition that it is all crap. “Creation science” is not as good as evolution. Both are imperfect, but one is more imperfect. We can never achieve the capital T truth, but we can come closer and closer to it by sustained open inquiry. 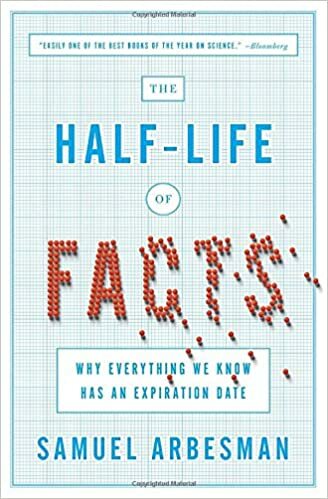 Getting around “The Half-Life of Facts,” the author, discusses these topics in a systematic way, what we all observe. Samuel Arbesman likens facts to radioactivity. A uranium atom will decay and turn into lead. For any particular atom that could happen in the next second or it might not happen for a billion years. You cannot predict the decay for any particular atom, but in the aggregate you can make an accurate prediction how long it will take. The term “half-life” refers to the number of years it will take for half the atoms to have transformed. Arbesman says that facts have a half-life. It differs depending on the precise field. Students in medical school are told that about half of what they know will be overtaken by events within five years. I am tempted to take refuge in my non-scientific education. History doesn’t change, does it? It does. Some of what seem to be hard facts change when we find evidence of what we thought was true is not. More to the point, interpretations and relationships change. History is not just what happened. Each generation has to make sense of it in the current reality. This is not really bad news, or at least not uniformly bad news. The idea of a half-life gives us a predictable method for understanding the decay of what we know. It means that we need to be continually involved in education. If you stop learning when you graduate college, you will pretty much know nothing useful by the time you retire. On the plus side, there is always something new to be learned and discovered.